COB LED's which are not only bright, but will last virtually a lifetime! Plus, it will always stay cool to the touch making them great for kids' rooms. truck boxes, RV's, and campers. SUPER BRIGHT - Equipped with new COB LED technology, the COB Switch Light can output 200 lumens of intense light. 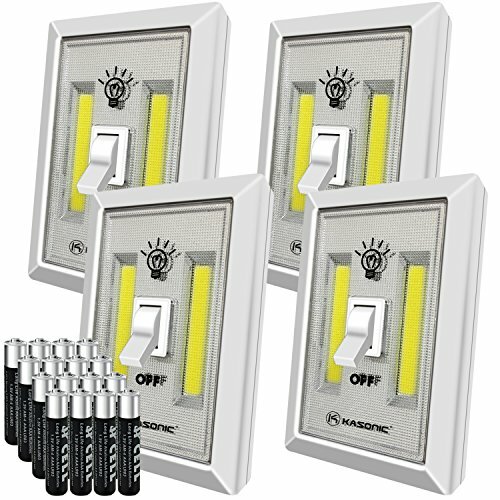 Perfect to keep the house light on in blackout and nighttime use. EASY TO INSTALL - It comes with two double sided adhesive tape and magnetic base which makes installation a breeze. It can be attached to any flat surface in a horizontal or vertical position. It can also be easily detached for use in another location. Simply stick it to your desired flat surface and it's ready for use. No need of tools or screws. PERFECT NIGHT LIGHT - to keep on your bed, near your bed on the side tables or stick it close where it will be handy to turn on when you need to get out of bed in the dark. You do not need to fumble or stumble your way in the dark when you get out of bed. BATTERIES OPERATED - Battery operated cordless for easy mounting, and fits in anywhere; Uses 4 AAA batteries (included), No more wiring to get in your way! If you have any questions about this product by Kasonic, contact us by completing and submitting the form below. If you are looking for a specif part number, please include it with your message.